Liu Thai Ker: I grew up in the British colony. At that time, we didn't have nationality. I was just a British subject and later, during the Japanese Occupation, I just felt that if you don't have a strong country, you cannot really have your own dignity and have a good life. This influenced me greatly and later, when my mother succeeded in persuading me to become an architect, I thought I would. 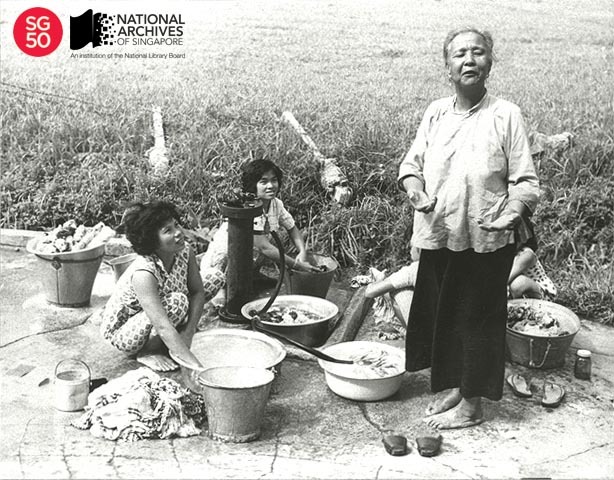 In those days, in the 1950s and 1960s in Singapore, three out of four people lived in squatter colonies. I thought I’ll grow up and help people build houses as an architect. But later, I felt that to be a good architect, I needed to know planning. I went to Yale to study city planning. All of this was designed to prepare myself to be ready to come back to Singapore to contribute to the building of the nation. Bharati: You grew up in Malaya at a time when things were very different. How did living in a village, in a kampung, influence your work? Liu: Initially, I lived in my grandparents’ house which was on the outskirts of Muar. It was a kampung environment - lots of vegetables and chickens and pigs and so on. Comparing the kampung life with urban life - with toilets, a clean water supply and so on - of course I wanted to be able to create an environment with those kinds of facilities. But on the other hand, having lived in a kampung and being close to animals, mud and vegetation, I also developed a feeling for nature and that also influenced my work later in life. We moved to Singapore after World War II. In the 1950s, when the British were still our colonial masters, we had urban slums and squatters and the environment was not very clean. Even with your eyes closed, you’d be able to tell you were at the Singapore River because it smelled, it stank of the pollution and the buildings were old and dilapidated. People were poor. My parents, despite the fact that they were schoolteachers, were desperately poor and I had to live in an environment that really would be considered by today’s standard, extremely poor. That was motivation for me to try to do something to change my life. Just after the Second World War when the Japanese surrendered, we lived in Dhoby Ghaut. In the beginning, we had sewage collectors. They would walk through our house and collect the sewage in a bucket, then walk through our dining room and living room back to the truck with all that smelly waste. That is certainly not something that I would like to have in my life. In Muar, we would have to walk 10 to 15 kilometres to a wooden hut to use a toilet. Bharati: You wanted to change your life, but you once said you wished you had worked to preserve a small part of the squatter areas. Did you ever experience that type of life? Liu: No, I was a little better off than that but when I was in HDB, I used to visit squatter colonies. One day after the rain, I asked my HDB colleagues to walk with me along Redhill which is now called Redhill Estate. It was a squatter colony and as we were walking on the mud road, rainwater was still flowing down the sloping road. In the water, there was human faeces, pig faeces, rubbish and so on. If you don't ever get to see the actual environment, it’s very hard for younger generations of Singaporeans to understand where we came from. So that’s still my deepest regret. I should have saved one to three hectares of land which is not a lot compared to the size of Singapore. I should have saved one or two or three hectares of squatter areas, keeping them exactly as they were, including a lack of sanitation, and maybe including a standpipe. Nowadays, when I ask young Singaporeans in their 40s if they know what a standpipe is, nobody knows. Liu: People in the squatter areas had no water supply to their homes, so the Government had to provide drinking water pipes in the area, not to every home, but every few metres, they put one. One pipe would serve a couple of dozen families. Every day, those families had to go to the standpipes to collect the water to bring back to their homes for drinking. So that was the kind of environment I was talking about. The power of convincing the younger generation through photographs or words would not be as strong as if they saw the real thing. It’s something I only thought about recently. Today’s Singaporeans not only have all these modern facilities, they also have other amenities like schools and sports fields and so on. To let them have a comparison would make them more appreciative of what they have and maybe even also more appreciative of what the Government has done for them. If they are more appreciative, on the one hand, hopefully their attitude towards society would be more positive. And on the other hand, they would also be spurred to say, “Okay, if the earlier generation could make such big changes, why can’t we also carry on improving lives?” I hope it will spur them to make solid changes. Bharati: You feel younger Singaporeans lack this ability? Liu: Well, I certainly sound like a grumpy old man but it’s not just my opinion. Without soliciting, I often hear my Singaporean friends, including people 20 years younger than I am, saying that if Singaporeans could be more appreciative of what they already own, they may become happier people so that they would not just complain at the drop of a hat and if there’s something not right, instead of just complaining maybe try to do something about it. Complaining doesn’t change your life. Noticing the imperfection and trying to do something to fix it would be more useful. Bharati: You wanted to fix things through your architectural expertise, but I understand you actually wanted to be an artist like your dad. You said your mother persuaded you to become an architect. How did she do this, considering you were quite set on becoming a painter? Liu: At the age of 17, I was thinking about my future because my parents had absolutely no money to send me to university. Someone asked me to be a substitute teacher in a primary school, so I did that. Some of the students in my class were 19 or 20 years old. They were older than me. Their studies had been affected by the Japanese Occupation. There were many years that they could not go to school. Through those few years of teaching, I accumulated some money. I thought that since my parents had totally no capability to send me to university, despite the fact that I had very good school results, why don't I just use the money to buy a passage to China and enroll in an art school. I announced it to my parents. I said, “In 2 weeks, I will be gone.” Of course my mother bawled her eyes out and told me not to do anything. She said, “Let me think of something else.” Remarkably, two days later, she found a solution. First, she persuaded me to do architecture because there was some art and creativity involved in that as well. And as an architect, I could lift the family from poverty to a better life. Secondly, at that time, the University of New South Wales had part-time courses, so that meant that I could work and study at the same time. That would make this journey more affordable for the family. So I thought, “Why not?” Frankly, in my mind I was thinking, “Okay, I will do something to make my mother happy, but after finishing university, I will go back to art.” Because of that thinking, when I went to Sydney I enrolled in art school to take art classes half-a-day every week. I did oil paintings, watercolour paintings. But by the time I finished my fourth year of a six-year part-time course, I started to realise that by being an architect I would be useful in taking Singapore out of its backward condition. I realised what architecture and planning could do for a nation. I decided to just spend my energy full-time on architecture. Bharati: Wouldn’t you say the arts would have been a useful contribution too? Liu: To me, changing a person’s physical environment was a more immediate mission. But while you are changing a person’s physical environment or city’s physical environment, it doesn't preclude you from doing art. In fact, if we had better housing, schools and so on, we could actually give the people a better chance to be educated and therefore pursue their intellectual or cultural activities. So I saw the physical environment as a catalyst for culture as well. In the early days in Singapore, because of our utter poverty, the Singapore Government gave priority to physical improvement and cultural development came later. Bharati: I ask you this also because you were chairman of the National Arts Council at some point. Some artists feel that even then, art should not have been an afterthought. In fact, sometimes, the best art emerges from strife and poverty. As someone with the instinct to be an artist, why don’t you see it that way? Liu: Yes, actually, I personally feel that there’s a tendency among Singaporeans to see cultural activities as an additional activity, meaning you go into it only when you are free. I don't think that’s a good idea. You have a point. I totally agree that in a lot of countries, art and culture, art and living are totally integrated. Here, there’s a line drawn between living and art. I wish that this can be integrated. But at that time, I guess for me, it was a matter of choice and under those circumstances, I made the best choice I could. I hope that today, more will be done to integrate art education as part of living rather than something that’s an add-on. At the moment, cultural development tends to be a kind of entertainment. It’s not. It’s really an expression of living a life. I personally also feel that in Singapore, if we were to stay on the forefront of nations, we not only have to look at further development of art, but also further development of intellectual thinking. I think we tend to be a little too pragmatic. It’s only through intellectual thinking that we can go deeper into a problem. By thinking more deeply, we can have invention. My job takes me out of Singapore quite a bit. When a job needs to be done, it needs to be 100 per cent. A shallow person will get it 80 per cent done and consider the job done. They meet the basic requirements and don’t look deeply into doing it better. I do find quite a lot of that amongst Singaporeans. But I find when I give people from other countries a job, they might take a slightly longer time getting it done but by the time they come back, it’s 100 per cent done. When you do that, you are making progress, you are making headway that other people don't make. It’s something I do worry about. Ours is basically a pragmatic society so if you get the job 80 per cent done and you feel that you can get by with your customers or your boss, you think, “Why not?” But when you do that, you would not go into other areas that people have not thought of. To me, that is an innovative society. We need more people thinking like that. This doesn't mean that we should abandon pragmatism. I think we should have everything - pragmatism, deeper intellectuals and appreciation of culture. We need all that. Bharati: How do you think we can achieve this? Liu: I feel that it has to start in school. We should ask more searching questions. I think when there’s a problem, we should not just stop at finding a solution. We should ask ourselves whether there is a way to do a better job than this? We need to have a greater emphasis on studying history and philosophy because through studying philosophy and history, you actually probe deeper into the subjects and that helps with intellectual depth. I was talking to an education expert from Scandinavia and asked him why arts education is important. He said it’s because it helps you imagine things. But he said you can do this in other aspects of education as well. When you teach a student a science subject or any other subject, you must take them through the class, not just by explaining what’s in the textbook, but going beyond that for them to think more deeply into the subject. So I said, “Then can we just do without arts education? If we can teach the other subjects in that way, why do we need arts education?” But he said “no” and said that arts education is very different from the other subjects because other subjects have boundaries. Arts education has no boundaries. You have to keep probing deeper and deeper. So when we have arts education, we shouldn’t treat it as skills training in the sense that you just learn to play the piano well, or draw an apple. Treat it as an exercise in probing deeper and deeper into the unknown. I think that can be very helpful. It’s an issue of what our definition of the purpose of arts education is. Technical training is important but on top of that, I think we need to use it as a medium to develop a person’s mind. Bharati: Even today, when it comes to the arts, there are still issues of censorship and disagreement over state funding. If we have so many out-of-bounds (OB) markers in Singapore, can we truly have a vibrant arts education that encourages probing without boundaries in Singapore? Liu: Personally, I feel that a society needs to have OB markers because otherwise, there will be a lot of conflicts. Bharati: That’s an assumption that some people make. But couldn’t talking about difficult issues also bring enlightenment and understanding? Liu: Yes. Actually that’s right. I personally feel that we certainly should talk about difficult issues, but not in an irresponsible way. In other words, you don't talk about something different or difficult for the sake of being different and difficult. You must have a basis for saying that. You must build up your argument for doing so. That requires intellectual depth. I'm a little bit concerned that it’s now become fashionable to speak irresponsibly just to create controversy. Then you are seen as being very clever and people clap for you. To me, that is not healthy. If you want to be different and you want to express new ideas, you have to build up a strong argument for it. That is a real intellectual depth. Bharati: You yourself created controversy a few years ago when you said that Singapore’s urban planners should plan for a population of 10 million. Some say you made a good case for it. Others asked why you would even suggest having so many people populate this tight space. Liu: If your economy is doing well, no government with any amount of power should stop population growth. Bharati: But economic growth at what cost? Liu: That’s why you need to be prepared. If you want your economy to grow, and your population grows but you are not prepared for it, you will have problems. If you plan well, the city can still be liveable. Singapore is unlike other countries. If you don't plan long-term, if you don't conserve your land carefully, use it efficiently, when you run out of land, you have no land to expand. You have limited land. So you have to use what you have more efficiently from the start to make sure you have enough for changing circumstances. To keep the economy growing, you need a growing population size. So what’s the reason for us not to plan long-term for large numbers just to make sure we can be self-sufficient. Bharati: We’ll talk about how you arrived at the figure of 10 million in just a moment, but you were CEO and Chief Planner of the Urban Redevelopment Authority (URA) between 1989 and 1992. Why didn’t you think that way then? Why didn’t you plan for a larger population? We could have avoided many of the overcrowding problems we’ve been facing for several years now. Liu: At that time, I was already worried that if we did not plan well enough, we would run out of land. In other countries if they run out of land, they just go into the rural areas. If we run out of land, we will hit the international line and we can’t build anymore. Most planning would plan in horizon for about 15 to 20 years. I felt that we have to plan for long-term. Bharati: But clearly, you didn’t. Liu: Let me explain. We adopted an “X” year concept. We would plan for “X” years. It was a term used by me. Liu: I decided to just use that term. If I told the people in those days that I wanted to plan for a hundred years, I think I would be told off, maybe I would even lose my job because nobody did that. Bharati: You were looking at 100-year horizon? Liu: It was meant to be 100 years. We proceeded to check with some experts. I asked them what the population size would be in hundred years. At that time in 1991, we had 3.2 million and our economy was just starting to grow faster. Very few of them projected beyond 4.5 million in year “X”. I felt that it was just too modest, so I decided to look at it in terms of by 2091, based on the projections, we would have 5.5 million people. Liu: Yes. By 2017, we already have 5.7 million. Did I make a mistake? Yes, but at least I jacked up the number beyond other people’s projections and secondly, being a very good Singaporean, I had the virtue of being kiasu. So despite that 100-year projection, I still kept a lot of land undeveloped so we would have room to play around with. I also negotiated with the Port of Singapore Authority for the ultimate boundary of land reclamation. Some of these are still not reclaimed, but it’s in the plan. There’s room for more. It’s just that our population projection was not accurate but name me one urban plan anywhere in the world where the population projection is accurate. Bharati: Considering this, how did you even arrive at 10 million? Liu: I learnt the lesson that population projections are really under-projections. I also learnt a second lesson because Singapore’s population grew faster than we could envisage in 1991. Why? If your economy is doing well, no government with any amount of power can stop population growth unless you tell society, “Look, I don't want economic growth.” Then you can stop the population growth. Which government will want to do that? In China they have the hukou system – a household registration system. They register in different districts. Despite this, Shanghai and Beijing cannot stop the population growth. Bharati: But certainly, it shouldn’t be a case of economic growth at all costs, should it? These things need to be calibrated, not just because of the infrastructural issues, but social issues associated with uncontrolled population growth. Liu: If you have made and implemented plans to accommodate population growth, the costs won’t be hard to bear. These are the lessons I’ve learnt. I still feel we need to face the inevitable reality of 10 million people. Bharati: But if as you say, you can’t control or even accurately project population growth, how did you land on the 10 million figure and the need to plan for it? Why not 20 million or some other random figure? Liu: Because I also read a UN report that said by 2075, the world can no longer support population growth. Between now and 2075, the world population may double but by then, the world’s resources can no longer support growth. Bharati: There might be technological solutions for that, or not. The point is, even that’s not certain. Liu: Yes, but based on that, I thought of 10 million almost like the ultimate number. But even if we plan this, I personally would still want to reserve some land just in case the UN prediction is not right. Bharati: You’ve said we can plan for 10 million and accommodate 10 million people without losing green spaces and heritage and conservation areas and buildings. How? Liu: I know Singapore’s land situation quite well and I feel that despite my proposal for 10 million, there will be enough land, including the future reclaimed land. We should keep all the interesting parts – historical areas, bungalows and even golf courses because we need all of this, to be a complete city. This would mean taller blocks and denser towns too. Bharati: But how liveable will the city be? Dense, overcrowded estates, parks, transportation nodes. Transport nodes have experienced that already. We’ve seen more MRT lines open up but clearly at one stage, the city wasn’t ready to accommodate the population comfortably because of the influx of immigrants. What about such issues? Liu: Yes, because at that time, we didn't expect the population to grow so fast. We didn't expect Singapore economy to be so successful. We need to learn our lesson. If we plan for taller and more dense development now, if we decide now, we can distribute the taller buildings more evenly across our island and therefore you won’t see big bunches of tall building in certain areas. If you do that, those areas become like a slum area. So if we do it now, we have better chance of creating an environment where you have a mixture of different densities. That makes for better living. For example, people not only accept, but love The Pinnacle. Why? Because The Pinnacle stands alone among the shop houses. If you put 20 such buildings next to each other, would you still love The Pinnacle? I want to avoid that situation. High-rise housing must be mixed with low-rise schools, parks, sports fields, low-rise neighborhood centers and so on. The definition of high-density is to create a physical environment where it’s very difficult to see the sky but if you mix them around this way, it’s still possible to see the sky. If we plan now for a larger population now, we can avoid possible future overcrowding on the transport system too. I’m happy to see that the Government in recent years has added quite a few MRT lines. But I just hope that they have done a calculation to see whether the train and the bus stations be able to cope with the amount of travelers. If they have done this calculation, then maybe the problem would be solved in due course. Bharati: Right now, we are seeing issues with the Bukit Panjang Light Rail Transit system. It will soon be overhauled. Minister Khaw Boon Wan said the Bukit Panjang LRT was an “afterthought” built under “political pressure”. Apparently they had not anticipated a need for LRT during the town planning stage. This resulted in the LRT having to be built around existing developments, incorporating “sharp turns over undulating terrain” and over time, leading to “power trips at the sharp bends". What alternative strategies would you suggest as a planner to anticipate such needs or to mitigate such problems? Liu: I shall abstain from commenting on the Bukit Panjang LRT. I will not want to be drawn into any political debates. If we plan for a larger population and do the calculations right. We can avoid problems. If the population does not grow as projected, then we’ll have more than we need. That’s better than not having enough. But if the population doesn’t grow, it would also mean economic growth is in trouble. Then we have a bigger problem. We have a chance to do it now. If we plan now, we can take better charge of the situation because now we have more land available for us to play around with the density. Bharati: Of course, the train disruptions are angering people too. Liu: That’s a separate thing. One is to plan for the needs and actually to have our MRT service and bus services. The two must be combined and done well. We need several factors. One is to set the target of how many per cent of people would want to travel by public transportation. Two is to plan according to such projections and three is to plan and develop them in good time. So I think currently, the development is slightly behind time. I personally remain reasonably optimistic assuming that they have done their calculations. For the transport issue, there is the maintenance factor. Maintenance is quite obvious that it’s not as good as one had wished. This is a management issue, not a planning issue. Bharati: Of course if the planning isn’t done well, the strain on the infrastructure could make maintenance even more arduous too. Liu: Yes, so as planners we plan as well as we can. When we talk about problems, we have to be very clear in what context we are talking about them. Bharati: There are plans to build some facilities underground such as storage facilities. Would your plan involve subterranean housing? Liu: No. Would anyone want to live and work underground? Some people have talked about it but to me, that is not an option. You can use underground for storage, because the goods don't complain. They don't need the sun and they don't need the see the trees. But human beings need to see the sun, need to see the trees. So that’s another reason that we need to plan now for 10 million so that we don't run out of land and need to go underground. Bharati: Why do you think our Government planners today are not doing what you’ve suggested in terms of thinking beyond the next 15 years? Liu: No idea. Since I left the Government, I haven’t really had a communication channel with the Government. But I hope that they will take the 10 million seriously and really try to study a plan for that. Bharati: You’ve mentioned the importance of preserving heritage and nature areas and even golf courses while being able to house a population of 10 million. But already today, at about half that population, we’ve seen several nature and heritage go or in danger of going. The loss of Bukit Brown caused quite a furore. There’s been a debate over the impact of the Cross Island MRT line being built beneath the Central Catchment Nature Reserve. With your plan, will there be more losses? Liu: Whatever we have today, I would say deserves to be kept for a long time. There’s no need to lose more. Bharati: Why are you so confident it’s possible to house more people without losing heritage and nature when urban planners today have not managed to inspire that confidence in people? Liu: I’ve also learnt that nothing is absolute. Even during my time, it was already made known that Bukit Brown would be gone. I cannot guarantee that what we have now will be kept. There’s a Chinese saying: “a sparrow may be small but it has all the organs of a bigger animal”. Singapore is not just a city. We are a country. We must have all the facilities of a country. I don’t want to lose heritage because if Singapore were to be a world-class city, you need to have heritage, you need to have culture, you need to have a beautiful natural environment, you need to have golf courses. If we don’t have all these things, we cease to be a world-class city. Bharati: Why golf courses though? Some have said they’re not at all essential. Liu: Well, leisure is part of living and also it’s good for businessmen as well and if it’s good for businessmen, it’s good for the economy. Bharati: So when planners today say that we have to sacrifice these and other heritage and nature areas for the sake of development, are they wrong? Liu: I’m not in communication with the planners but if I look at the map of Singapore, we do have spaces that we can use without sacrificing heritage and nature. We still have land not reclaimed and I must say, every time I take off from Changi to go overseas, I’m very, very happy to see the that Pulau Tekong is now reclaimed to be a much bigger island than I envisaged in those days. We could also redevelop some of the industrial areas because a lot of the industrial areas in the earlier days were single-storey terrace factories. Now, you can actually intensify these. So we can also hopefully use some of the excess land for housing, for commerce and so on. If the planners say that we have very little land. We can’t go for 10 million, I would say if that’s the case, it’s even more critical that we plan for 10 million now. If we plan for 15 years or maybe add another 10 to 20 years, we might use up all the land, but the population might continue to grow because the economy is still booming. Will we then say, “There’s no more land, so we should stop economic growth?” Is that a good idea? Bharati: Could we have avoided losing some heritage buildings or nature areas had planners over the years done a better job of using land efficiently? Liu: Off the cuff I can’t think of anything that has been a serious loss. I would say so far, our Government has done a very rational job. Some things I believe were necessary. In urban planning, you have to make a choice between heritage, nature, rivers and cemeteries. Personally, I feel on issues like cemeteries like Bukit Brown - the priority should be for the living rather than for the dead. Each issue needs to be examined independently. Bharati: What’s your stand on the Central Catchment Nature Reserve issue? Liu: I’ve left the Government and I don’t want to get drawn into the controversy, but since you asked, I would say that MRT line investment is expensive so if the same line can go through more urban areas, picking up more passengers, first of all, you get a better return for your investment. Secondly, you serve more people than if you go underground without income and without serving more people. You save some time for the people on the line but you cause more people not being able to take the MRT lines. So I think the subtotal of it is quite different. I think we should look at the bigger good. But I must say, this is comment based on pure theory. I haven’t really studied the problem. When it comes to places like Rochor Centre, I would say I believe the Government has probably done an economic study. It’s public housing but in a place with a very high land premium. By tearing down and redeveloping for something of higher value, to me, makes economic sense and I personally feel that that’s not a bad decision. Bharati: Some people are now also taking issue with the loss of farmland. Liu: I haven't made any study of that except that some time ago, I heard a talk about farming and this speaker said that it’s unrealistic for us to hope to be self-sufficient on our food supply. On the other hand, we still must maintain our vertical farms to do research because there is business for us to use more scientific ways to ensure quality food. What is more important is for us to create an urban environment which is as liveable as possible. If you want to have a small farm area to demonstrate to people how chicken and pigs and cows and goats live, I would say it can be considered but I don't think we can count on developing a large farm to give us good food supply. That, to me, is quite difficult. Bharati: While being a proponent of nature and heritage, you also seem to take what some would describe as an unsentimental economic approach to the issues. How do you personally strike that balance? Liu: You have to think of all of the factors at the same time. Sometimes, the sentimental wins out. Sometimes you have to look at the alternatives and see if they will contribute to liveability more considering the limitations. For different issues, certain factors may take higher priority than the others. But as a planner, you have to consider all of these factors. Bharati: Are there any spaces or structures that you feel we absolutely should not lose in the future? Liu: Off the cuff, nothing really comes to mind. But I feel we can develop without losing more. I would say serious things to lose would be things which are valuable to us but irreplaceable such as nature and historical buildings. Bharati: Your plan, I understand, envisages a mega city made up of five smaller cities, each one with a population of just two million or so with its own Central Business District (CBD), own hotels, own cultural centre. The Government has planned a second CBD in the Jurong Lake District. What do you think of the current plans as a whole for Singapore? Liu: If you want to create a CBD, you have to consider if the population size will support the CBD to fill the jobs and support the retail. You have to consider the increased amount of traffic and so on. You have to consider the increased demand for schools, universities, hospitals for the increased population. For the western part of Singapore to have a CBD, I feel that theoretically, it’s fine but I feel that we need to think about all these related issues. But won’t it be better if we consider the whole island as one whole collection of systems? That means if Singapore in the future would have four other secondary CBDs and all the traffic, the roads and the MRT lines and so on are planned at the same time and planned for a bigger population. It would give us better assurance that we will have a better environment, a good environment in the future for everyone living in each city – everyone will have the opportunity to live and work in one city. That means you don't have to spend a lot of time traveling long distances. You can go home to spend time with the family. Bharati: You were Chief Executive of the HDB between 1979 and 1989. You made an impact in several areas including in the planning concept – the move from large-scale estates with localised facilities to new towns that were actually self-sufficient. But what would you say to people who feel that the flats that were built at the time didn’t really address liveability in the sense that they followed a cookie-cutter model? I want to say one thing though. Despite the high degree of standardisation, I did take care of two things among others. One is to give the places identity. I put non-housing buildings like churches, temples and community centres as much as I could at street corners to give the building blocks some identity. Also, we didn’t spend money adding aesthetic features to the buildings but I still wanted the buildings to be beautiful, so what did I do? I learnt from Miss Universe. What’s the difference between Miss Universe and ordinary girls? Why is she prettier? It’s because she has nice proportions so I spent a lot of time working on the proportion of the HDB building façade. In every HDB building, the relationship of the window sizes to the balconies to the size of the window panels and so on they are all carefully calculated and proportioned. I also introduced a concept of street architecture. That means if you have a row of buildings in one whole block from one street corner to another street corner, that row of buildings should not be all flat. It should go up and down, so the whole street facade looks like a piece of artwork with rhythms and so on. If you look at the Bishan estate from Bishan Park, now, the buildings going up and down – that’s the result of street architecture. It was deliberate. It was not as thoughtless as some of the critics would say. Bharati: You are the Chairman of the Centre for Liveable Cities’ Advisory Board. What other elements would you say absolutely cannot be compromised or must be introduced in order to ensure liveability here? Liu: The purpose of planning can be summed up by two words. One, is people. The other, is land. The city needs to be functional and the economy has to be sustainable. These are the two fundamentals. This is the starting point, but to achieve them you need to think about liveability, resilience and so on. It’s a whole string of issues. Liveability involves health, education, culture and jobs and so on. You have to think about a green environment, low carbon emissions and so on for sustainability. We’ll have to also understand the basic human needs. To give you an example, I think one of the reasons that we have achieved good racial harmony is that in HDB estates, we provided religious sites for different faiths. The Chinese, Indian temples, mosques, and also churches. Always think of human needs – not just the practical ones, but the ones for human well-being and plan for it. We need to ensure protection of rivers, hills and in certain areas, we even protect the mangrove swamps and so on to keep the natural biological species. We have to consider many factors all at the same time. Bharati: One of the things you take pride in is your focus on creating community spaces within housing estates. Some have remarked though that physical spaces don’t really help if people aren’t willing to interact. A lack of neighbourliness is an issue in many estates. Increasingly, people are interacting more online than in physical community spaces. Do you feel like your efforts have failed or are futile? Liu: The concept of community space has been around for centuries. The most original community space is the village well for people to gather around while collecting water. In modern times, despite the introduction of telephones, some people still gather at community spaces, because face-to-face contact cannot be replaced by phones and emails. I think as a planner we can only try our best to provide the physical environment, conducive to human interaction but we cannot force the people to behave the way we want them to behave. But we cannot use that as an excuse for not creating conducive environment. I often tell people that in HDB estates, we have provided a vertical kampung, but I'm waiting for you to show me the kampung spirit. I remain hopeful that as long as the planner does his job to create a conducive environment, all you need is just one or two leaders in the community to lead to push it and things will happen. Bharati: You said earlier you regret not having preserved a small part of the squatter areas. Do you regret anything else? Liu: I wish that when I was at the URA, I had prepared more aggressively for a larger population. Planned the road traffic and MRT more like for a collection of five cities rather than five regions. If I had done so, the job of planning for a population of 10 million would be more easily done now. Bharati: What legacy do you want to leave? Liu: I feel that the fact that I started in HDB and with the help of all my colleagues, we created highly self- sufficient new towns and the segmented corridors to create a sense of community. I really hope this kind of community spirit can in time to come, nurture a stronger understanding of the culture and art and attitude to life among the different races. Not only will we achieve harmony but we would also enrich our understanding of life. I want to leave a legacy of having created such opportunities.